This is a software utility that removes all traces of your computer usage and web browsing. 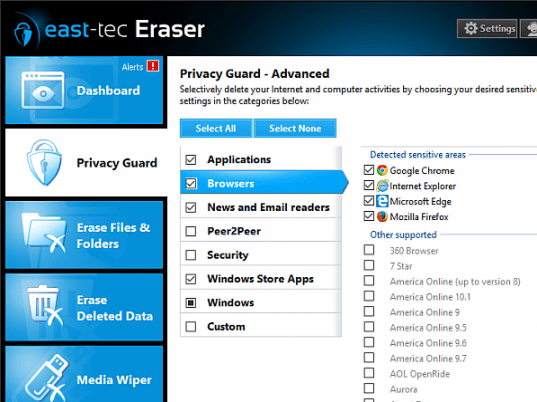 East-Tec Eraser 2011 will protect your data and privacy. It helps remove all evidence of your computer and online activity. Eraser is claimed to meet and exceed government and industry standards for the permanent erasure of digital information. It will help you remove all the traces of sensitive data from your computer. Details like Internet history, Web pages, pictures, unwanted cookies, conversations, and all traces of files, confidential documents, e-mails deleted in the past, or contents of entire drives, USB flash drives are removed. It will work with most of the current web browsers including Internet Explorer, Mozilla Firefox, Google Chrome, AOL, MSN Explorer, Opera, Safari, Netscape Navigator. Traces of usage of a large number of applications including Yahoo Messenger, MSN Messenger, AOL Messenger, ICQ, Outlook and Outlook Express, Mozilla Thunderbird, Eudora, Limewire, Morpheus, Windows Media Player, RealPlayer, Winamp, Google Toolbar and many more can be removed too. The tool has an intuitive interface and a wizard makes it simple to use. The controls are intuitive as also controls are grouped into logical groupings in tabs. The tool will automatically clean up the computer at specific intervals. It comes with a anti-surprise key that in a single key stroke hides what you have been doing. This can bring you out of those critical situations when your boss or spouse suddenly appears on the scene. But what is really useful is the choice of several methods of clean up that ensures the cleaned up data cannot be recovered at all. There would not be any accidental erasure of your files/folders as the utility would seek confirmation for all the delete commands. Over 17 years of experience in protecting your sensitive data and privacy, and securely erasing all evidence of your Internet and PC activity. Go beyond any system optimization or cleanup tool, improve your PC performance, keep it clean and secure! east-tec Eraser exceeds government and industry standards for the permanent erasure of digital information and easily removes every trace of sensitive data from your PC: Internet history, Web pages, pictures, unwanted cookies, chats, conversations, deleted files, confidential documents, e-mails, USB flash drives or cards. east-tec Eraser cleans away evidence from the latest versions of the most popular Internet browsers (Google Chrome, Microsoft Edge & Internet Explorer, Mozilla Firefox, Opera, Safari, and more) and over 350 popular programs (Microsoft Office, Dropbox, Flash Player, Skype, Adobe Photoshop, Windows Media Player, the Facebook app, and many other audio, chat, entertainment, Internet, office, productivity, and security applications).